Before the annual calendar switches over and we officially ring in the new year, I find myself perusing the races on UltraSignup. I clear the filters and look at the expansive inventory of possibilities while dreaming of the epic adventures that potentially await. I click on races that seem to excite me for one reason or another, delving into the details. I trend toward events that both terrify and motivate me. An odd combination of feelings to describe to an outsider, but for me if there isn’t intrigue and a bit of fear, why do it? I find myself giddy, but notice that I am white knuckling the computer mouse as I examine race dates, distances, elevation gain/loss, the level of competition, and more. After picking one or two goal races, I then seek training races to help support these exhilarating aspirations. Once I feel like I have what could be the scaffolding for my season, I look into the process of gaining entry into each of the races. With lotteries, race caps, deadlines, and qualifying components, it seems that the planning every year needs to start earlier and earlier. I lose sense of time as I fantasize about an app that takes into consideration the races I am interested in and alerts me when online registration opens, if a deadline for a lottery is approaching, or if there is a race-entry price increase about to happen. An added feature would be an algorithm that determines the likelihood of making it to the race start healthy, since we are oftentimes financially and logistically committing to a race six to 12 months in advance. The reality is that, as far as I know, this app doesn’t exist yet so for now I need to rely on my chicken-scratch notes of race details. For races that have made my list, I then consider several factors before pulling the trigger and actually registering. I used to be click happy and just register for races, but I now try to be more deliberate by factoring in the timing of race, race/season goals, and the difficulty and cost of travel. The timing of a race is a factor when planning a season. If you are taking an off season, then sufficient time to return to training and prepare for a race is important. Also, depending on where you live, factoring in winter training conditions is important. It can be extremely challenging and frustrating to try to perform at an early race when during your training you’ve been struggling just to keep warm let alone complete a workout. It is also important to allow ample time in between races to allow the body and mind recover. There isn’t a one-size-fits-all method of determining the length of recovery needed, but listening to your body is critical and then giving it a little additional time once you think you are ready to start focused training again. Factoring in the amount of travel and overall cost of attending a race is important. How long will getting to a race take if all goes according to plan? What is the current price of gas if you are driving or the price of airline tickets if you are flying? Budget can be a limiting factor, but planning in advance can help you make economical decisions and plans. I like to use the old adage, “If there is a will, there is a way,” understanding that it may mean that I do not get to stay at the same hotel as the bulk of other runners or eat out every meal, but that is sacrifice I am personally willing to make if it means I can attend a race. Determining goals for a running season and for individual races helps in establishing training objectives and can help with perspective. Try to be realistic in goal setting, while working to have each goal be meaningful, obtainable, and measurable. Remember that not every race has to be an ‘A’ race, as races can be used for training purposes. Training races allow us to prepare and experiment ahead of our focus races. 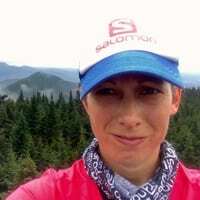 Choosing to do a race as a training event gives you time to practice specific elements of your running such as nutrition and hydration, pacing, powerhiking, or putting new gear to the test over a longer period of time than you normally would in a training run. No matter if it is your goal race or a training race, having different levels of goals or objectives can be beneficial. Just because you aren’t on track to have the flawless day where all the stars align doesn’t mean you shouldn’t stay focused. Having multi-tiered goals for each race honors the fact that things sometimes happen and gives you reason to still execute. Not only after each training race or goal race, but also throughout the training process, make sure to give yourself time and space to evaluate your progress as this helps you with keeping focused. It also allows for adjustments to be made with training and/or future goals. In life, planning helps with all endeavors and this certainly holds true to what we as ultrarunners commit to with our running seasons and everyday lifestyles. As you look forward to your 2017 season, I hope that you dream big, train smart, and take time to learn from your successes and failures, along with the mediocre performances that fall in between. What does your planning season look like? At what time of year are you making plans for next year’s races? How do you develop the framework of your racing season? Do you choose your big goals first and then plan around them? Or does your life beyond running decide when and where you can focus the most on your running, and where you can’t? When thinking about next year, I try to match the race with what conditions my training will be. I just moved so a lot of my early training will be on the treadmill (combination of work hours, sunlight and not knowing where I am and what is safe). That means I need to be strategic about races where I will succeed. Great read Aliza! You would totally rock Cayuga- Cheers to a fulfilling and successful 2017!! Personally, I like to make a spreadsheet with all the races I believe are within my very limited budget (including travel and lodging) and then make a plan. Things change depending on lottery results, but this really helps me get organized and create a training plan. I love color-coding things and assigning separate columns for different factors such as race distance, cost of entry and whether or not it’s a qualifier for something else. The app DOES exist!! In fact, I just launched an app called Kukimbe in October. It finds races across the country using geo-location. Would love to talk to you more about it and have you check it out. I run about 20 races per year and was incredibly frustrated by the cumbersome process of finding races. I wanted something fun and mobile friendly. Kukimbe Race connect is free and available on the App Store and on Google Play. Give it a whirl – nothing to lose. Would love to get in touch with you to talk more! Thanks!